A pair of walkers were airlifted from the Pennine Way near its northern-most reaches after one of the suffered a suspected mild stroke. Border Search and Rescue Unit was called out on Tuesday evening to the couple on the English-Scottish border. The couple, in their 60s and from Lancaster, were nearing the end of a walk after leaving one car at Tow Ford and one at Cocklawfoot in the Bowmont Valley. As they made their way along the ridge that forms the border between Northumberland and Scotland, approaching Windy Gyle, the 60-year-old man became unwell. Damon Rodwell of BSARU, said: “His 66-year-old companion left him as comfortable as possible and set off to find help, taking with her their six-month-old terrier Sam in her rucksack. “With a fading mobile-phone battery, she managed to put out a 999 call, but details presented to the Border Search and Rescue Unit were a little confused and contradictory. “The team was scrambled at around 7:30pm, with very little daylight remaining. 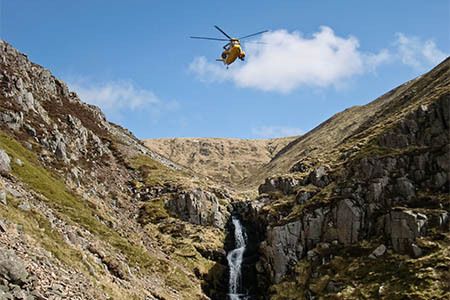 The potentially serious condition of the male walker dictated that time was of the essence, and the first rescue vehicle to reach Cocklawfoot proceeded directly onto the hill towards Windy Gyle. “When further vehicular progress became impossible, two team members set off on foot. “Initial reports that the stricken man was at Windy Gyle proved wide of the mark, and a search plan was put in place, with a trio staying at the team’s mobile control and communications trailer near Cocklawfoot and the remainder of the 14 rescue volunteers deploying to various reasonably accessible points along the Pennine Way. Mr Rodwell said she was able to give only very sketchy details of where she had left her companion, and an RAF Sea King helicopter, already en route from Boulmer, was asked to conduct and aerial search. After about half an hour, the man was found, having mustered the strength to set off in search of help. The two walkers were about two miles apart and moving in divergent directions. Both needed immediate evacuation, and were airlifted to hospital. Deputy team leader Stuart Fuller-Shapcott, who was in the lead group and found the woman, said: “With confused information coming in, the onset of darkness, a potentially very serious medical casualty and the fact that the walkers had expected to be finished well before nightfall and may be without torches and adequate clothing, we knew this was an urgent one. “It was a very satisfying result. We had 14 team-members turn out, leaving home and families and making a round-trip of up to 130 miles to attend the search. “It looked like it could turn into a very protracted search, and we had two neighbouring teams ready to join us. “Tweed Valley MRT were already well on their way to Cocklawfoot with a large contingent, and Northumberland MRT were on standby. The terrier Sam was put into the care of Mr Fuller-Shapcott’s wife Gayle, also a BSARU member, and a veterinary nurse. He was reported to be unfazed by his adventure and his first helicopter flight, and curled up and slept like a lamb. Border Search and Rescue Unit is celebrating its 50th anniversary, having been formed in 1963. It covers the south-east of Scotland including the Cheviot Hills, the Lammermuirs and the River Tweed, working in tandem with the Borders Water Rescue Team. More details can be found on the team’s website.